Aiming to make India self-sufficient in coal, Power and Coal Minister Piyush Goyal today said the target of doubling domestic production from the current 490 million tonnes level was "possible". He even went a step further and said the country should make efforts to become an exporter of coal by drawing up a clear roadmap for the same. "We have plans to ramp up coal production to a billion tonnes from its current level of 490 million tonnes. It is clearly doable, it is not a fanciful target, they have 200 mines which have not yet opened up, technological innovations can make it possible," Goyal said. Out of the total domestic coal production of 565 million tonnes, Coal India produces 490 million tonnes. This is targeted to be doubled to one billion tonnes annually by 2019. The state-run firm will invest Rs 5,000 crore to buy 250 rakes for transporting coal. The Minister said India should not remain an importer of thermal coal for power plants but on the contrary should be in a position to supply to the world and increase its own power generation capacity significantly. 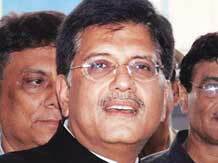 Goyal said this after meeting global investors where he assured them that the government will address their concerns. "The investors have had serious concerns in the last 4-5 years like stalled projects, rupee depreciation and uncertain business environment," he said. However, with the new government in place this has started to change. They are looking at India afresh and going forward the investments in the power sector are going to be quite large and investors both from within India and abroad can see good, robust policy which we are reassuring to all the investors, he added.